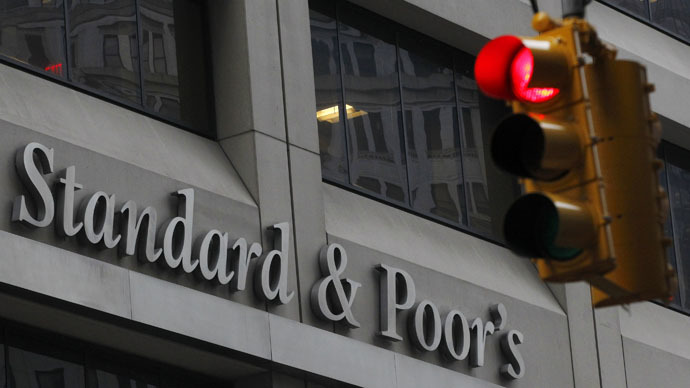 The Standard & Poor's rating agency and the US Justice Department are negotiating a settlement of a claim filed against S&P in 2013 for passing off junk securities as high-level assets ahead of the 2007 financial crisis. The agency may have to pay compensation of up to $1 billion, Bloomberg reports citing its sources. The companies that received S&P’s high ratings issued unprecedented amounts of low-grade mortgages sold to investors as securities. Many of them turned out to be worthless despite their high investment-grade ratings. The amount claimed against the agency was initially $5 billion. Now the Justice Department and several dozen prosecutors have reduced the sum to $1 billion. Paying such a fine would rob the agency of an entire year’s operating profit. The settlement is likely to take place in the first quarter of 2015. The agency has hired four law firms to protect its interests in court. Similar claims were filed against Moody's Investors Service and Fitch Ratings. S&P denies any wrongdoing and believes the claims are unfounded. Russia has long criticized the ‘Big Three’ group of rating agencies and has sped up efforts to balance the dominance of the Western financial institutions in the global arena. On Tuesday, China and Russia announced the launch of a joint rating agency in 2015 which is expected to become a rival to the existing ‘Big Three’ of S&P, Moody’s and Fitch. On Friday international ratings agency Fitch downgraded Russia’s credit rating by one notch from BBB to BBB- with a negative outlook, leaving the country a peg above the non-investment rating known as ‘junk’ status. Experts say the move won’t have a dramatic impact on the country’s economy as the decision doesn’t reflect the reality. Russian Finance Minister Anton Siluanov said in December the government is going to discuss its policy and the economic situation in the country with international rating agencies to “extend their understanding” of the issue. S&P representatives suppose the American government’s move followed the agency’s decision to lower the sovereign credit rating of the United States from the highest level of AAA to AA + in August 2011. The decision was sharply criticized by the authorities. US banks and financial institutions have paid more than $40 billion in fines for violations the authorities believe were triggered by the financial crisis. Back in October 2008 the Bank of England calculated the losses caused by the overestimation of securities (mortgage, corporate and other bonds) in the UK, US and eurozone at $2.8 trillion.